You may also like. 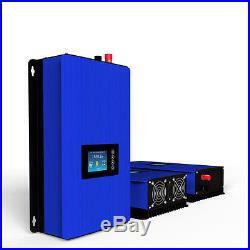 Here for sale is 2000W solar system kit w/ 12pcs 160w solar panel & 2000w grid tie solar power inverter. This system is for charging home power applications water pumpPCTVLED light etc.. For the 2000W 220V grid tie power inveter, it is our newest power inverter. 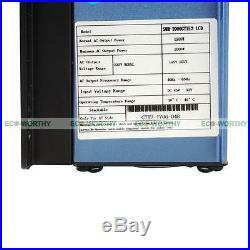 Limiter & MPPT function makes the solar system durable & efficiency. For the 160W poly solar panel with its high power output and the robust design the right solution for a stand-alone system. Even on cloudy days, the poly solar panel delivers a high energy yield. The panel is covered by a special tempered glass to protect against environmental conditions such as hail, snow and ice. The panel frame made of anodized aluminum ensures the stability. High modules conversion efficiency. Excellent performance in low light environments. Fully self powered on-grid systems. Suitable for commercial and power station property. 160W Poly Solar Panel. Open Circuit Voltage(Voc). Short circuit current (Isc). Temperate coefficient of Isc. (010+/- 0.01) %/? Temperate coefficient of Voc. (0.38 +/-0.01) %/? Temperate coefficient of power Voc. Kind of glass and its thickness. 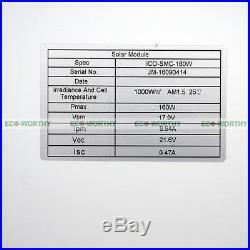 Low Iron, high transparency tempered glass of 3.2mm. 148066835mm (57.8″26.3″1.4). 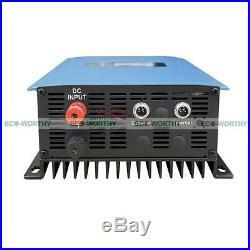 2000W Grid Tie Power Inverter. 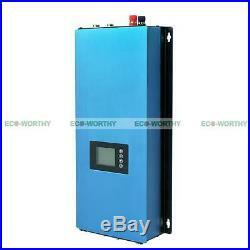 AC Output Voltage Range. AC Output Frequency Range. 51.5x30x15cm(20.3″x11.8″x5.9). 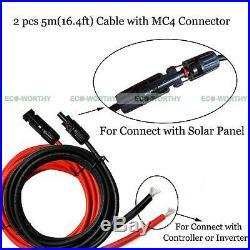 1 pc 10m solar cable w/ 1 pair MC4 connector. For movable, suspended or fixed installation in photovoltaic systems at temperatures ranging from -40? To +120? For use indoors, outdoors, in explosive areas, and in industrial, commercial, and agricultural applications. Which with 3 male and 3 female of MC4 connector. 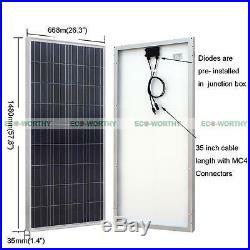 To Connect Each Solar Panel in Series or in Parallel. One Male/Male/Female(MMF) Branch Connector One Female/Female/Male(FFM) Branch Connector. Note: FOR THE EUROPEAN PLUG, YOU NEED TO CUT IT. 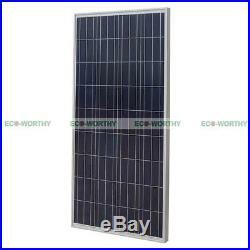 12pcs 160W Poly Solar Panel. 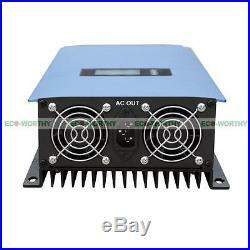 1pcs 2000W 220V Grid Tie Power Invertr. 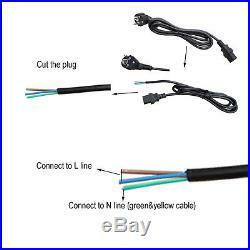 1 pair 5m solar cable. 2 pairs Y MC4 connectors. Goods in stock in USA, goods will be send by UPS. Or USA customers the most important things. For other countries may be bring some. Whenever you feel confuse or. Trouble , please don’t hesitate to let us know. We will try our best to help you at first time we receive you message. 1solar, we strive to serve our customers and resolve any issues. If your shopping experience with us is anything less than five stars. We appreciate the opportunity. To correct any issues you have before you leave feedback. We do appreciate your consideration and looking forward to doing business with all the clients and companies. 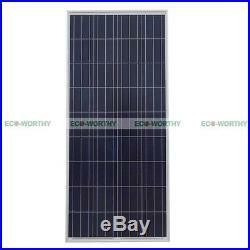 We are manufacturers and wholesalers of solar panels and renewable energy products. Our solar business has been established since 2002. OEM and ODM services are both available. We would like to be your best supplier in China. Please take our working time into account. We will reply you in time, if you are in our working time. If you haven’t received our reply within one days, We must be out of work. Please contact me through. Public holidays in China is not available for message reply. 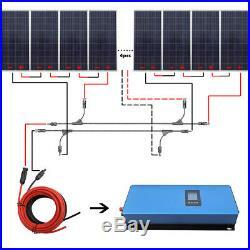 The item “12PCS 160W Solar Panel 2KW Grid Tie Solar System 220V Power Inverter Charge Home” is in sale since Friday, July 14, 2017. This item is in the category “Home & Garden\Home Improvement\Electrical & Solar\Alternative & Solar Energy\Solar Panels”. The seller is “goodenergytools” and is located in Rosemead, California. This item can be shipped worldwide.